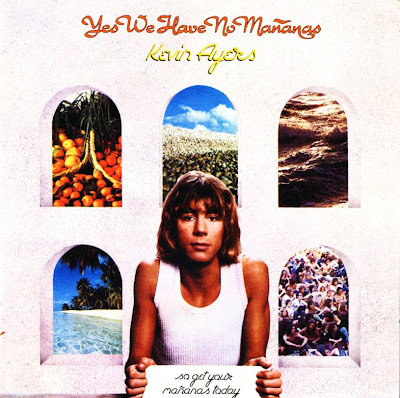 Yes We Have No Mañanas (So Get Your Mañanas Today) is the seventh studio album by Kevin Ayers, released in June 1976. This LP marked Kevin Ayers' return to the leftfield Harvest label. Producer Muff Winwood employed a straightforward pop production that clipped some of Ayers’ usual eccentricities from the tapes but gave the set a direct and focused impact. The songs fall into to two thematic groups; tales of love and loss (‘Love's Gonna Turn You Round’ and ‘Falling In Love Again’) coupled with sly digs at a music industry with which Ayers is clearly becoming disenchanted (‘Ballad of Mr. Snake’ and ‘Mr Cool’). The closing song, ‘Blue’, is a rousing tour de force with a spirited chorus and Ollie Halsall's frantic guitar that ranks as one of Ayers strongest 1970s recordings. The band comprised Rob Townsend from Family on drums, Taste’s Charlie McCracken on bass, B.J. Cole's steel guitar and Ollie Halsall’s frenetic power-pop solos.